It's nice to be able to announce a new plugin I've been developing for Rhino v5 and Grasshopper to import/export Green Building XML ( gbXML) files. Lots of aspects to implement and improve on, but I've advanced to a state where more public feedback and suggestions will help inform and shape this tool. 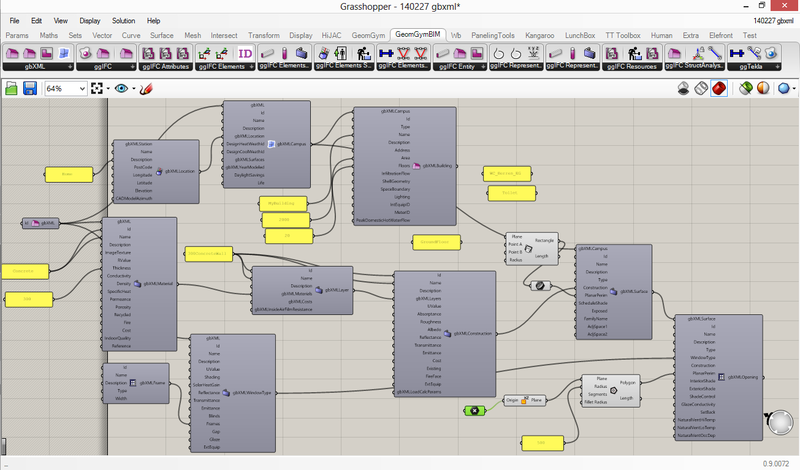 In Grasshopper, there are components to generate gbXML data in accordance with the schema. Like the IFC plugin, this can be a bit intimidating to start, but should quite quickly become familiar. To write out to file, for this plugin you select the gbXML generating component and bake this with conventional Grasshopper Bake icon. 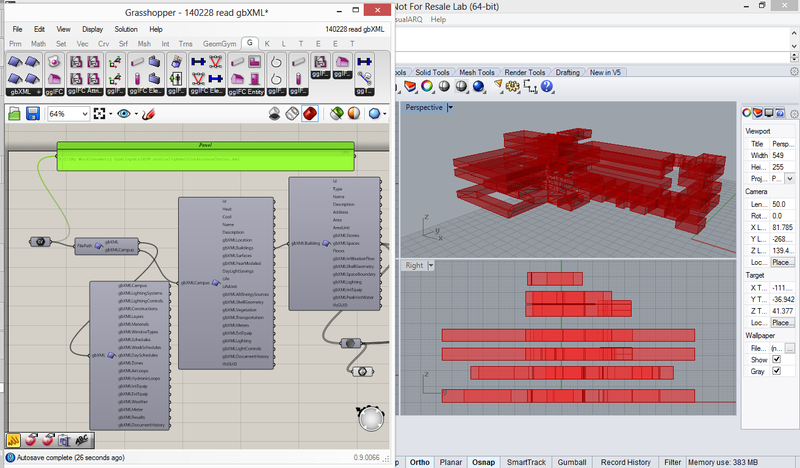 Here's a sample grasshopper file generating some walls and openings. As well as generating gbXML data, it is possible to interrogate, amend (and modify) existing gbXML files generated from other software. The modifying components are hidden at this stage. Grasshopper primarily duplicates data (with appropriate modifications) rather than modifying existing. This makes data expiry (such as undo) quite difficult to implement which I still need to consider. If you wish to access let me know. Sample grasshopper file. Thanks to Michal Dengusiak who has been instrumental in testing (and shaping) the tools thus far. He's been testing the resulting data in TAS, who have also been generous in validating the generated gbXML and advising on technical aspects. I look forward to getting feedback from other users interested in this. Man! This was without a doubt one of the most interesting and informative articles I have ever read. Kudos! I have installed Geomgym for some time now. I can't see gbxml. Is it because my license expired?